School of Medical Instrument and Food Engineering, University of Shanghai for Science and Technology, Shanghai, China. Received 31 July 2009; revised 31 August 2009; accepted 3 September 2009.
in time by ECG. 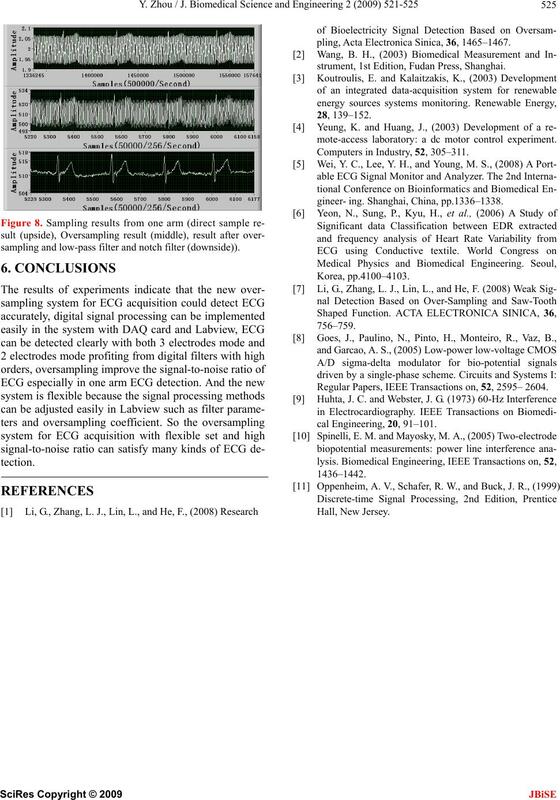 So ECG is used widely in clinic . 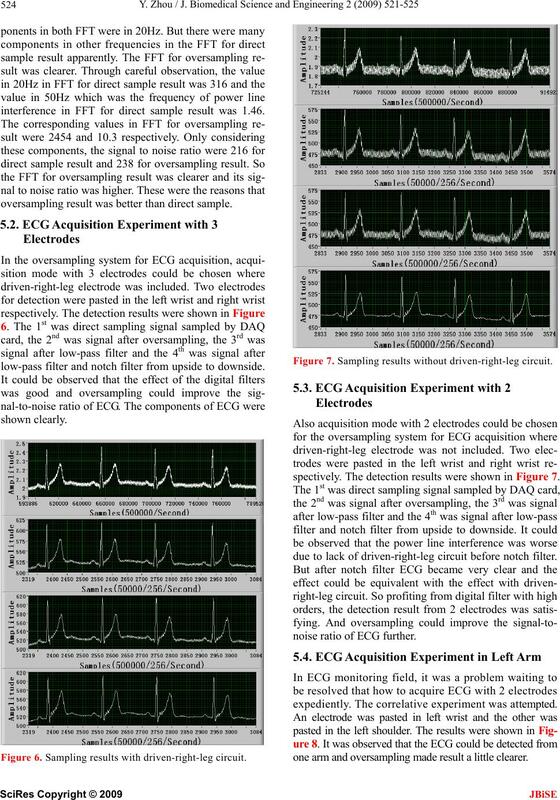 focus on the ECG’s analysis and processing [5,6]. the use of oversampling in biopotential detection [1,7,8]. cuit, DAQ card and Labview. Young Teachers in Shanghai Universities (slg08029). tion, traditional circuit was improved on. ply was from DC supply. Figure 2. 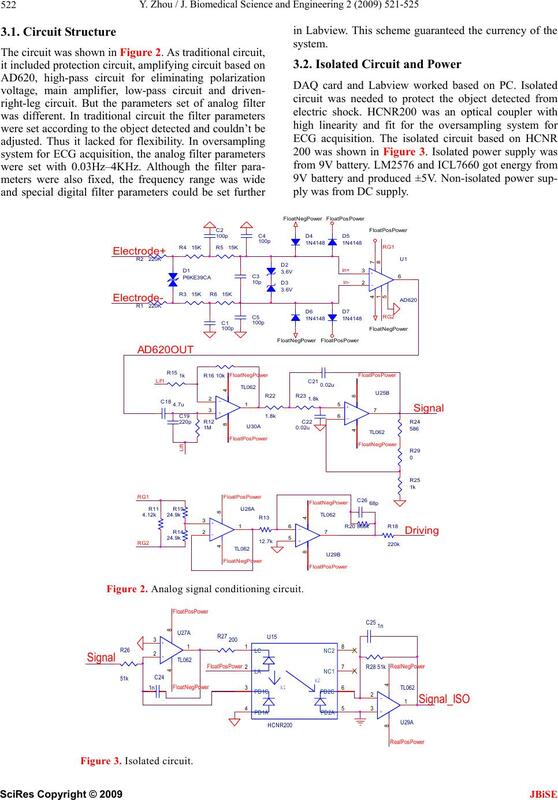 Analog signal conditioning circuit. DAQ card, digital filter, oversampling and etc. DAQ6221 was a data acquisition card with PCI interface. Its highest sample rate for single channel was 250KHz. because of the high-speed cpu of PC. Bessel, order was set with 50.
oversampling could satisfy Nyquist sampling theorem. resolution of DAQ card’ ADC was improved with 4 bits. Continuous sampling mode was chosen for DAQ card. sampling was 244Hz. It was also right for ECG. Some experiments were used to validate the design. produced by signal generator was input to DAQ card. sult was better than the direct sampling result apparently. interference in FFT for direct sample result was 1.46.
oversampling result was better than direct sample. low-pass filter and notch filter from upside to downside. Figure 6. Sampling results with driven-right-leg circuit. Figure 7. Sampling results without driven-right-leg circuit. spectively. The detection results were shown in Figure 7.
due to lack of driven-right-leg circuit before notch filter. noise ratio of ECG further. expediently. The correlative experiment was attempted. one arm and oversampling made result a little clearer. pling, Acta Electronica Sinica, 36, 1465–1467. strument, 1st Edition, Fudan Press, Shanghai. 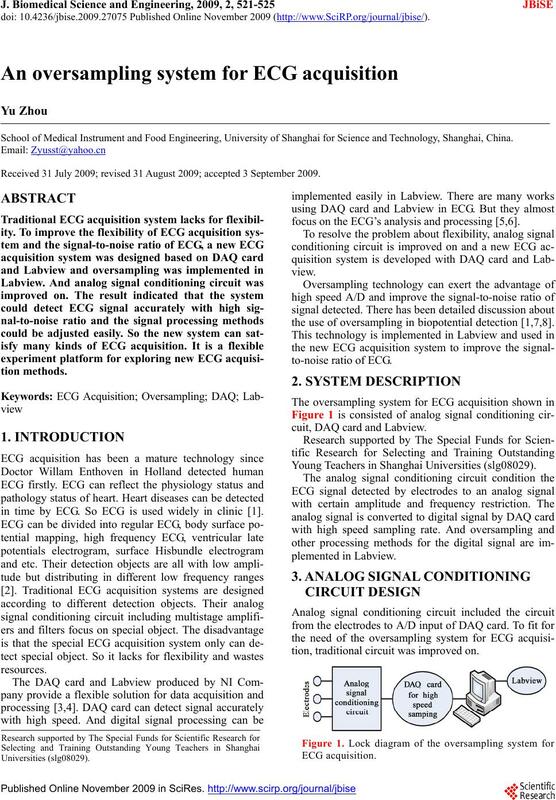 mote-access laboratory: a dc motor control experiment. Computers in Industry, 52, 305–311. gineer- ing. Shanghai, China, pp.1336–1338. sampling and low-pass filter and notch filter (downside)). Regular Papers, IEEE Transactions on, 52, 2595– 2604.